This is the most thorough study that I have ever seen evaluating the effectiveness of pre-K programs. The study was done by researchers at Vanderbilt University. The study was reported on by the well-respected but leftist Brookings Institute. Launched in 2009, the TNVPK Effectiveness Study, a coordinated effort between Vanderbilt’s Peabody Research Institute and the Tennessee Department of Education, is a five-year evaluation study funded by the US Department of Education, Institute for Education Sciences. It includes the first randomized control trial of a scaled up state funded pre-K program and the first well-controlled comparison group study of the effects of program participation as children progress through elementary school..
Policymakers and proponents often cite some of the famous early studies of pre-K programs that have shown long term benefits extending into adulthood for the participating children. But those were studies of especially complex programs that are unlike scaled-up public pre-K in many ways. The Vanderbilt study is the first rigorous controlled longitudinal study to be conducted on a large-scale state-funded pre-K program. 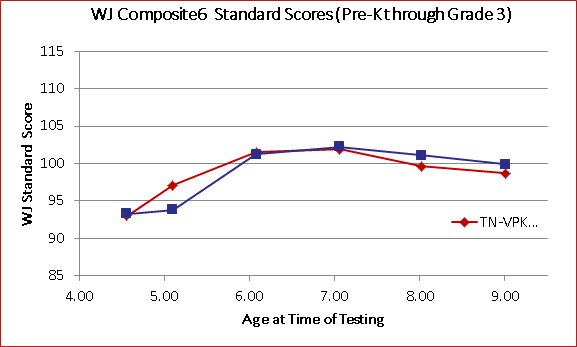 Standard score results from pre-K through 3rd grade on a composite measure that averaged the six achievement subtests are presented from baseline forward in the graph below. As is evident, pre-K and control children started the pre-K year at virtually identical levels. The TNVPK children were substantially ahead of the control group children at the end of the pre-K year (age 5 in the graph). By the end of kindergarten (age 6 in the graph), the control children had caught up to the TNVPK children, and there were no longer significant differences between them on any achievement measures. The same result was obtained at the end of first grade using two composite achievement measures (the second created with the addition of two more WJIII subtests appropriate for the later grades). In second grade, however, the groups began to diverge with the TNVPK children scoring lower than the control children on most of the measures. The differences were significant on both achievement composite measures and on the math subtests. Differences favoring the control persisted through the end of third grade. In terms of behavioral effects, in the spring the first grade teachers reversed the fall kindergarten teacher ratings. First grade teachers rated the TNVPK children as less well prepared for school, having poorer work skills in the classrooms, and feeling more negative about school. It is notable that these ratings preceded the downward achievement trend we found for VPK children in second and third grades. The second and third grade teachers rated the behaviors and feelings of children in the two groups as the same; there was a small positive finding for peer relations favoring the TNVPK children by third grade teachers, which did not meet traditional levels of statistical significance. We are already seeing that cheap daycare in high-tax, big government provinces like Quebec cost a lot, and produce negative results. And of course Hillary Clinton is a longstanding advocate of universal pre-K. As a Senator of New York, she introduced a universal pre-K plan that would cost $10 billion over 5 years. President Barack Obama’s own Preschool for All plan would cost $75 billion over 10 years. This Vanderbilt study should cause us to question whether the policies of the secular left, pushed largely because of emotions and ideology, are worth the tens of billions of dollars they want to take from us. And if you take tens of billions of dollars out of families, then families on the margin will have to give their children to the state to raise. And that includes Christian families, who would no longer be able to afford a stay-at-home mother. Now, taking children away from parents so that their mothers can work is seen as a worthy goal by those on the secular left. First, communally raising the children is “good” because it removes inequalities between single mothers and traditional working-husband homes. Second, making it easier for women to “go fatherless” is “good” because fathers are not to be trusted to teach their children about morality and religion. That is best left to secular government workers. Third, mothers who choose to marry good providers pay less in taxes if they choose to stay home with their kids and not work. That is “bad” because the government wants more taxes, so they can spend it on vote-buying social programs. Fourth, children who form stable bonds with their parents are less likely to become dependent on the government, meaning their allegiance cannot be bought with government handouts. That is also “bad”. Fifth, it is also “bad” that children who grow up with stay-at-home mothers are more likely to develop empathy and morality, which gives them an independent standard by which to judge the government’s actions. I’ve complained before about Quebec, the most liberal and secular province in Canada. Well, one of the things that makes them so crappy is their policy of encouraging women to abandon their young children to strangers in government-run daycare. The government takes a whole lot of taxpayer money, often from traditional single-earner homes, and uses it to subsidize government-run child care. Well, now we have a brand new fresh study to show how wrong this policy has been. Canada’s radically leftist CTV News reports on the study. In a paper released Monday, a group of university researchers say that children exposed to the province’s child-care system were more likely to have higher crime rates, worse health and lower levels of life satisfaction as they have aged than their counterparts in other provinces who didn’t have access to the same type of system. […]In their paper made public Monday through the National Bureau of Economic Research, Kevin Milligan from the University of British Columbia, Michael Baker from the University of Toronto, and Jonathan Gruber from MIT in Cambridge, Mass., update work from 2008 to see if children in the Quebec care system kicked their troubling behaviours over time. To do that, they analyzed four different data sets from Statistics Canada that touched on child outcomes, health and crime rates and scores from standardized tests that are connected to the national Council of Ministers of Education. What the trio found instead was “striking evidence” that exposure to the program was associated with higher crime rates, with the effects most acutely seen in boys. Boys were more likely to have higher levels of hyperactivity and aggression, the researchers wrote, while girls showed declines in prosocial behaviour, which captures many altruistic activities like donating and volunteering. All of those behaviours fall under the heading of “non-cognitive” abilities, such as impulsiveness and emotional stability. Exposure to the program was also associated with “worsened health and life satisfaction,” the study says. There was no such lasting effects on math, science and reading abilities, the researchers write. By the way, in case you are wondering – yes, that is the same Jonathan Gruber of MIT who was the architect of Obamacare. Surprising that he would be co-author on a study that dings big government. Are these results unique to Canada? Let’s take a look at a recent study from the UK. Academics at Oxford University discovered that exposure to some forms of early education contributed to bad behaviour and could be linked to emotional problems. […]In the Oxford study, researchers recruited 991 families with children aged three months. Mothers had an average age of 30. Researchers assessed children at the age of four through questionnaires about their behaviour and emotions completed by teachers and parents. They also observed care provided by mothers and observed non-parental care for at least 90 minutes for those children placed in formal childcare settings. The report, published in the journal Child: Care, Health and Development, said that “children who spent more time in group care, mainly nursery care, were more likely to have behavioural problems, particularly hyperactivity”. The study, led by Prof Alan Stein, of Oxford’s Department of Child and Adolescent Psychiatry, found that “spending more time in day care centres, over the total period was a predictor of total problem scores”. Well, that’s only Canada and the UK. Maybe things are better in Sweden? Here’s a second article from the National Post (one of Canada’s national newspapers) about Sweden’s government-run universal day care system. True, parental leave in Sweden is a generous 16 months. There are no babies in daycare. But when parental leave ends, practically the reverse is true: A full 92% of all children aged 18 months to five years are in daycare. Parents pay only a symbolic amount for this; tax subsidies for daycare are $20,000 per child, annually. Swedish taxes are among the highest in the world, and the tax system was designed to make both parents seek employment in the work force. […]Then there are the questions about the social toll Sweden’s childcare system is taking. Sweden has offered a comprehensive daycare system since 1975; since the early ‘90s, negative outcomes for children and adolescents are on the rise in areas of health and behaviour. While direct causation has been difficult to prove, many Swedish health-care professionals point to the lack of parent involvement beyond the first 16 months as a primary contributing factor. Psychosomatic disorders and mild psychological problems are escalating among Swedish youth at a faster rate than in any of 11 comparable European countries. Such disorders have tripled among girls over the last 25 years. Education outcomes in Swedish schools have fallen from the top position 30 years ago, to merely average amongst OECD nations today. Behaviour problems in Swedish classrooms are among the worst in Europe. Now this idea of government taking children away from families is very popular on the left, because they want children to be “equal”, and that means getting them away from their parents so that the government can raise them “equally”. You can even see Hillary Clinton pushing for it when she talks about “universal pre-K”. Well, maybe it’s time that someone showed her the studies. Not that she strikes me as someone who cares a lot about children, given her support for born-alive abortions and organ harvesting. Mom is staying home because Dad can afford to let her: do kids benefit? New study using National Institute of Child Health and Human Development data is discussed on the Family Studies web site. Critics of such arrangements highlight the fact that developmental risks, like increased rates of insecure attachment and elevated levels of aggressive behavior, have been found to be associated with the extensive use of non-family care in America. Advocates, in contrast, stipulate, usually without qualification, that if the quality of care is good, then children benefit; and, indeed, that it is the limited quality of care available to too many parents in the USA that is responsible for any negative effects on children that emerge in the research literature. All right, so the big-government, anti-family people say that day care as such isn’t bad for kids, the negative effects that are observed are not caused by too much day care, but by the low quality of the day care. The conservative, pro-family, limited-government crowd thinks that quality doesn’t matter as much as quantity – too much day care is bad for kids, regardless of quality. […][T]he National Institute of Child Health and Human Development (NICHD) funded, to the tune of at least $150 million, the NICHD Study of Child Care and Youth Development. It recruited more than 1,000 children (along with their mothers) in 1991 from 10 different research sites, and followed them from the first month of life to age 15. Among other purposes, the NICHD Study was designed to investigate the claim that long hours of day care initiated very early in life posed risks to children’s social and emotional development; and, should this prove so, to evaluate the proposition that such negative effects would be due to the poor quality of care that children received, not the quantity of care they experienced across the first five years of life. NICHD Study’s findings on the effects of day care proved more consistent than inconsistent with my “developmental risk” claim. And they provided virtually no support for the idea that it was poor quality care that accounted for the negative effects of “early, extensive, and continuous” care (initiated very early in life, for long hours, and continuing for many years).2 Specifically, our many research reports revealed that the more time children spent in any kind of non-familial child care, and sometimes specifically in centers, the more aggressive and disobedient they proved to be at two (but not three) and 4.5 years of age, as well as across their elementary school years; and the more impulsive they proved to be at age 15, at which age they also engaged in more “risky” behavior than children who experienced far less non-familial care across their first five years of life. Critically, despite spending millions to carefully measure the quality of care, using methods and measures developed by the proponents of the “it’s quality, stupid” view, the study never found that the quality of care accounted for these quantity-of-care effects. In other words, the problem behavior associated with early, extensive, and continuous care emerged irrespective of whether quality of care was good or bad. Read the whole thing, and don’t feel guilty if you can’t do the best for your kids. I am sure that everyone reading this post is going to do the best they can for their kids. But for those who have not yet had kids, let this be a lesson to you about what you should be studying in school, where you should be working, how much you should borrow, how much you should spend. A stay-at-home mom is expensive. It cannot be finessed with feelings and following your heart to fun and thrills. I know there are lots of Christians around the world who read the Bible and understand that there are certain goals laid out in the Bible for Christian parents who are raising their kids. As far as I can tell, young Christians seem to think that these goals will sort themselves out all by themselves through God’s mysterious predestination, or some other such fideistic wishing. What it really boils down to is that young people want to do what they want to do, and they can sound pious about it by saying God will somehow make their crazy plan work out. Well, that’s not effective, and young Christians would never act so ineffectively in any other area of their lives – ignoring how things really work. Look the Bible has information about the specification that God expects you to implement. Part of that spec involves requirements for your kids. If you decide that the Bible is not trying to give you a spec, you’ll fail to deliver. 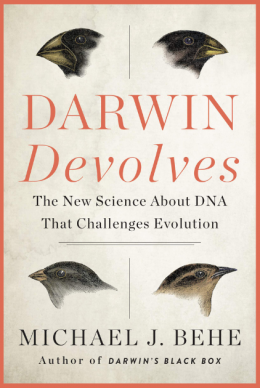 If you decide that you don’t need to read studies to know how the world works, you’ll fail to deliver. If you decide that following your heart is something that God rewards more than intelligent thought, you’ll fail to deliver. You cannot feelings your way out of this assignment, you’ve got to solve the problem, and that means reading the studies and making a plan that delivers results. So, young people. If you want to do the best for your kids, you better stop doing what feels good, and start engaging in some serious self-denial and self-sacrifice. Fumbling around chasing happy philosophy bubbles to Europe through your teens, 20s and 30s is not the right way to prepare professionally and financially for kids. Your love for your future kids begins with your decision to grow up and do hard, boring things that need to be done. You won’t be able to fix the child care costs problem at the 11th hour if you follow your heart for the first 10 hours. Keep in mind what child care looks like in places like Ontario, and what your children would be learning, and who they would be learning it from. Make a plan now.